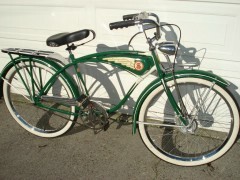 A 1937-serial numbered Schwinn Cantilever Hanging-Tank Autocycle. Has welding-gas relief factory holes at the end of Cantilever bars!! 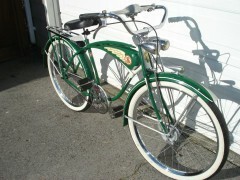 Sports SUPER rare Double Duty forks!! 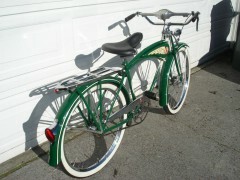 Painted in original Coach Green and True Ivory Schwinn paint ! !